Hi lovelies! With less than 4 weeks to go until we get married, I wanted to squeeze in as many wedding themed blog posts as I can before our big day arrives! Today, I thought I'd share something a little different as I know many people out there getting married right now have budgets to stick to. While some budgets are larger than others, finding little ways to save money here and there is never a bad thing! On your Wedding day, it's tradition for the Bride to give her Wedding party a little gift on the morning of the Wedding to say thank you for being there with them and for all their help in planning the day. I didn't want to share the gifts I actually have for my girls (though if your interested, I will show these after we get married so that there'll be no snooping from my girls beforehand!) but I did want to share with you a little DIY I've done for them (and myself!) as I think this alone would make an incredible gift, especially if your budget is pretty tight. 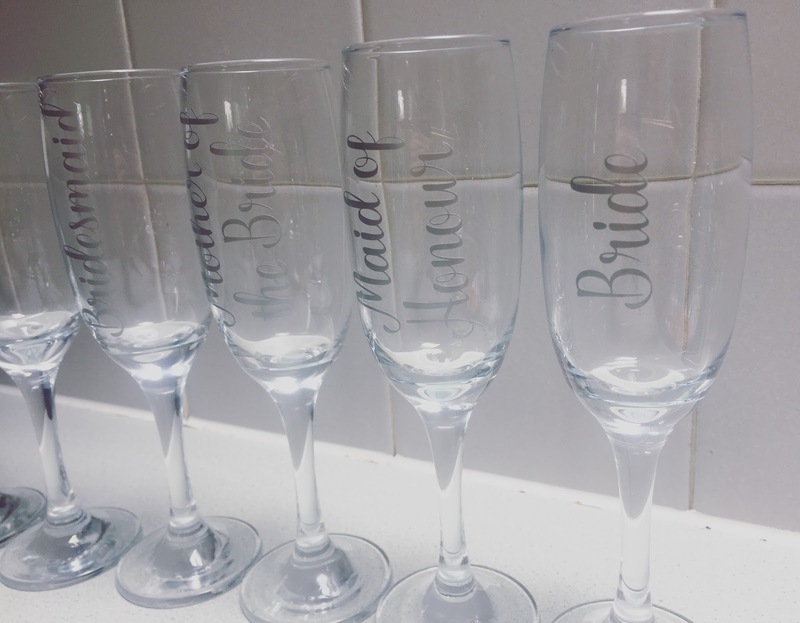 I'd seen these personalised Champagne flutes a lot on Pinterest and when I searched for them online, they were pretty expensive! A lot of the nicer ones that I found were around £15 each, which when you have 5 Bridesmaids, a Maid of Honour and a Mother of the Bride to buy for, really adds up (especially if, like me, you want one for yourself as well!). At that price, I'd have been spending £120 on glasses alone, which even if I had the budget for, I absolutely would't do! So, I had the idea of making them myself and headed off to trusty old eBay for a hunt around. I searched for wine glass decals and loads of options came up at seriously low prices. After a pretty quick browse, I found these ones, listed here, the listing is for 10 decals, which got me all 8 of these as I got 5 Bridesmaid ones, a Bride, a Maid of Honour and Mother of the Bride (MOH and MOTB count as two words, this is explained in the listing). All of these were just £4.75 with free shipping and you could choose your own wording and which colour you wanted. 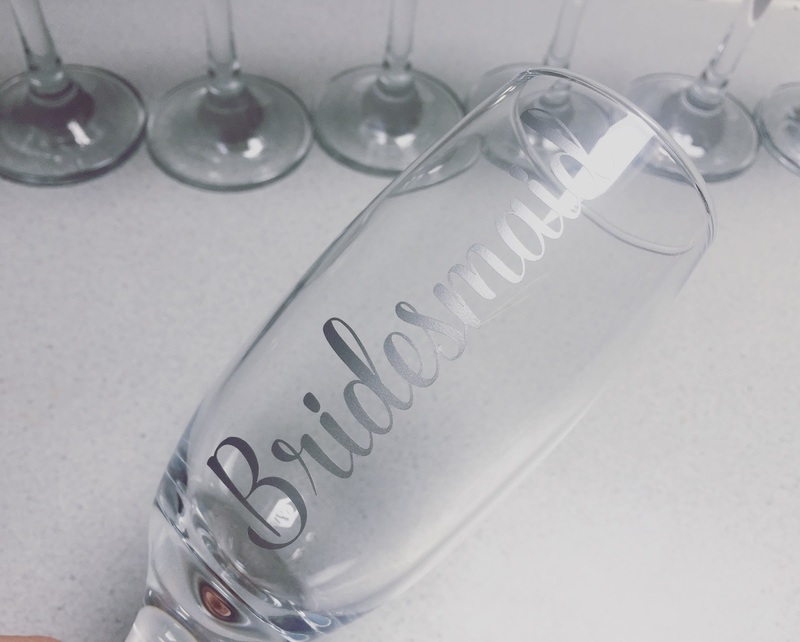 They arrived on clear transfer tape and were super easy to apply to the glasses, you simply cut around the wording, place it on the glass, ensuring all air bubbles are gone and then carefully peel back the tape, leaving your pretty wording behind! Now I haven't tried, but I'm going to go ahead and assume these aren't washing up bowl/ dishwasher safe, so while they can be used on the Wedding day and for photos, it may be best to give them a careful rinse and keep them as a keepsake after that. As for the glasses themselves, as I almost always do with glasses (they get broken far too often in our house), I headed to Wilko's. These very pretty and super sturdy Champagne flutes were just 50p each! So I got all eight for £4. This brings our total for the lot to a mere £8.75. Not bad when you could've been spending £120! 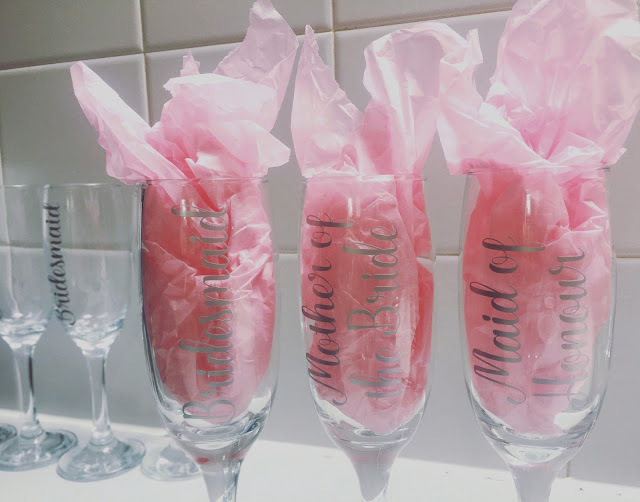 When you've put your words on the glasses, you can then pop in some tissue paper in the colour to match your Wedding theme (I'll be switching this out as mine isn't pink, though I do think this looks super pretty!) and you're done! You could pair these in a gift bag with a miniature bottle of Champagne or Prosecco and you've got a super impressive and very inexpensive gift! If your budget stretches a little further, these would also make impressive wedding favours for all of your guests, as you can get 10 names for £4.75 and a glass for each guest for 50p, would work out to a litter under £1 for each guest, which is an absolute bargain and could double up as place settings for each guest - win win! What do you think of this gift idea? Will you be doing something similar for your maids on your big day? If you've done any DIY for your Wedding, let me know as I'd love to hear about it! BLOGGY BRIDES: DON'T CALL ME A BRIDEZILLA!